There are many analogies between the environmental crisis of the 1960s — caused by the toxic pesticide DDT — and today's widespread contamination of the oceans with plastic, a Canadian marine biologist says. A prominent Canadian marine biologist has warned of a second "silent spring" — this time in the world's oceans — due to the vast amount of plastic that has entered marine ecosystems in the last half-century. In 1962, Rachel Carson helped launch the modern environmental movement with her book, Silent Spring, which raised the alarm about the toxic effects of the pesticide DDT on wildlife. She warned that DDT was having subtle and unexpected effects on animals, in particular thinning the eggs of birds of prey so that chicks were not surviving to hatch. Now, more than 50 years later, Boris Worm, a marine biologist at Dalhousie University, thinks there are many analogies between the DDT crisis of the 1960s and today's widespread contamination of the oceans with plastic. "This is a global phenomenon. Plastics are everywhere in the ocean, much like DDT," Worm said in an interview with CBC's Quirks & Quarks. "I think the scale of the problem and the scale of its effect on wildlife, for one thing, is only becoming apparent now." Contamination of marine systems by plastics has been documented by researchers worldwide in recent years, and it seems to be accelerating. A study released earlier this year estimated that eight million tonnes of plastic enter the oceans every year. And that plastic has found its way into a disturbing range of ecosystems. 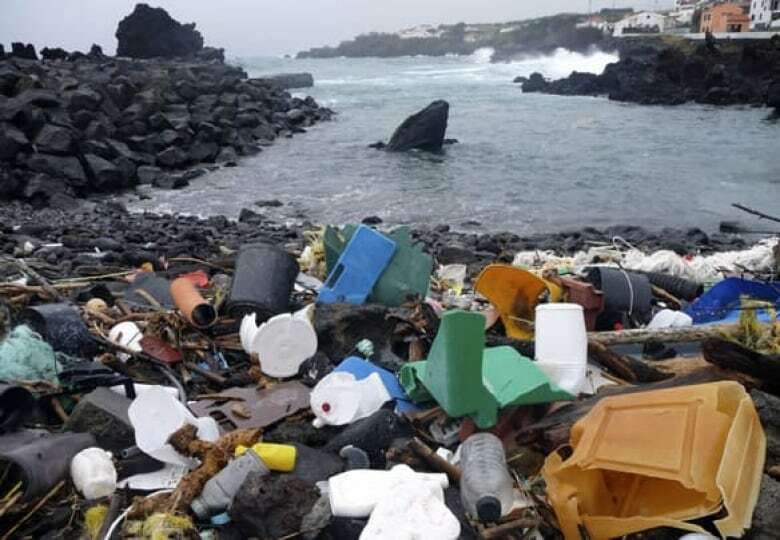 This photo from the conservation group 5 Gyres shows a coastal area of the Portugal's Azores Islands in the middle of the Atlantic Ocean littered with plastic garbage. (5 Gyres/Associated Press)Perhaps best known are the ocean gyres — areas where large amounts of floating plastic have accumulated in easily visible "garbage patches." Of perhaps even more concern is research that has revealed less visible, but pervasive contamination by "microplastic" — tiny particles perhaps a millimetre in size or smaller. These are fragmented pieces of many different forms of plastic that have been found in beach sand in the most remote parts of the world, in sediments in the deep ocean and frozen into arctic ice. The source of much of this plastic is unknown. It includes abandoned or lost fishing gear and illegally dumped waste, but the largest source is likely garbage and debris carried into the ocean from land. Worm's concern is that we're now starting to see evidence of serious impacts of this plastic contamination on marine life. 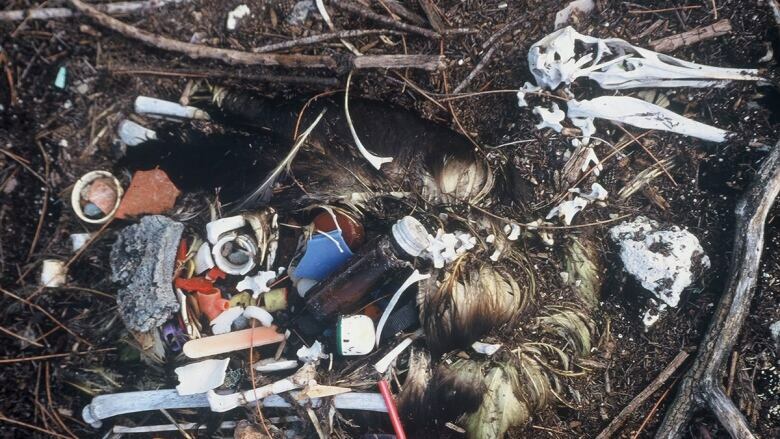 His warning was motivated by a new study suggesting that currently 90 per cent of seabirds — including albatrosses, petrels and penguins — are now contaminated with plastic. "They fly or swim around, and snap up brightly coloured pieces that look like zooplankton," said Worm. Once ingested, the plastic gets lodged in their digestive tract, interfering with feeding, or they regurgitate it to feed their offspring, "so the young get filled with plastic and that's their demise too." But seabirds, according to Worm, may just be the canary in the coal mine, because a blocked digestive tract is not the only way plastic may do harm. While plastic is not necessarily a direct toxin like DDT, it can potentially have other effects. He said some plastics "can become poisonous when they chemically or physically absorb other pollutants from the water, concentrating them up to one-million-fold. They're a sponge for other pollutants to attach to, and that way they can get into other marine life and into humans too." Of particular concern are plankton, the base of the marine food chain, and animals that comb food directly out of the water like shellfish, which could absorb contaminated microplastic and accumulate toxins. At the moment, though, Worm says the risks here aren't well understood. "We have really only begun to study these effects and a lot of people are scrambling right now to understand what it does." But action need not wait on that research, Worm suggests. "We have to get to grips with how dangerous this stuff is and how can we limit its release into the environment." Many countries have made great strides in regulation and control of plastics entering the environment. But studies suggest that a large proportion of plastic in the oceans comes from developing countries, mostly in Asia, which are struggling with fast growth and inadequate waste-disposal systems. Any solution will take time and effort, but even so, the problem is going to be with us for a long time, Worm said. "Like DDT, this problem isn't going away by itself — these are persistent pollutants that stay around for centuries."